Now that we're through the show, back home and rested, how did it go for you? How was your traffic? Did you hear any new music? If you came to check out gear, what were your impressions? I had non-stop traffic on Saturday. From the time I opened the door until I finally closed up around 8:00pm, the room was packed. Most of the time I was playing BluRay videos, and people often stayed for several songs. Some people asked to play their own music. One guy that sometimes brings in some pretty weird stuff asked to play his disk. Of course, I did, but winced as it loaded up. Turned out, it was one of the best new disks of the show for me. That's one of the things I love about the show - I discover a handful of new performers I like. Two I discovered this year were Zachary Breaux and Madeline Peyroux. I liked that Breaux disk that John was playing. I had nowhere near the traffic. Wayne you are the man when it comes to setting up a room. Your room looked so nice and having it right at the elevators was a great idea. I'll be back. I enjoyed myself a lot besides the whole family getting sick which gave me an ear infection and listening to music wasnt very cool at that point. I have to get more efficient at packing. I brought a uhaul trailer and man that fits a lot of stuff, so I packed it full. Repacking took the entire morning and out til 2pm. If you would like to build a Lighter Note or Lightspeed please see www.buildanamp.com for LDRs and kits. You might be right about being near the elevator. I've always been somewhere down the hall, once in the corner and once on the odd floor. This time, I was right at the entrance and it makes sense that would tend to increase traffic. I empathize with you on the cold. I got one too, started feeling it Saturday night and by late Sunday night when I got home, I felt terrible. Just now starting to feel a little better. One thing I learned early on about these shows is to keep it simple. Show one system and present it well. I used to bring more than one system and I agree with you about the packing hassle. It's also double the setup and takedown time. And since I can only be in one room at a time, one room is basically unmanned. That's OK, I suppose, but it does divide my focus and make everything harder. Hi, We had a lot of traffic as well. Always someone there. Right up to about midnight (I hit the sack at 10, Rodney and others played the KT120s until midnight or so) I was glad the rooms were virtually soundproof. Rodney got a cold as well. We escaped...but there was horrible wind on the way home over 50 mph for the last two legs of the trip (Big Spring to Las Cruces and from there to Arizona). All in all a good event. I strongly suspect we will be there next year. Yeah, I could see you were doing well. In the past, I loaded a U-Haul 5x8 trailer with everything I had and wound up with so much stuff in the room that it was disruptive to change equipment. This year, I brought exactly two pairs of speakers. much easier to run the demos, since the visitors has fewer options. I didn't see my first visitor until ~10:30. I thought the day was going to be a bust. In retrospect, it just took that long for visitors to make their way from the elevators to my room. After that, I had someone in the room all the way to 5:30. It was a very good day. I actually made a sale plus a lot of good exposure. Yeah, I don't think I actually opened the doors until 9:30am or so. I guess I kinda figure people won't want to get up early on their weekends. But if you're one of those guys that gets up a 6:00am and has finished a cup of coffee by 7:00am, then 10:00am probably seems pretty late in the day. Good deal on the sale, Bob! I was impressed with the little Alpair TL's. The low end was quite nice for such little drivers. I could see those making an awesome HT setup. They would be great for a bedroom or small apartment rig as well. Bruce, I was sincerely impressed with the OddWatt series of equipment. They all seemed to do a superb job with what they fed, and for the money I think you've got the best bang for the buck going out there right now. 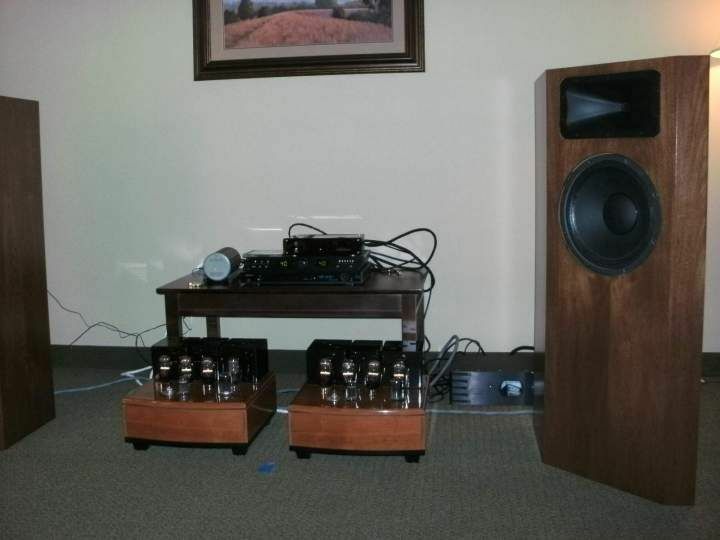 If I only had the extra $$$ one of those Forewatt's would be mine. Damn kids and college sucking away my fun money!!!! Did anyone here venture into the Found-Audio room? They had two systems: 2A3 (I think) and EL84. How did they sound?